Create a naturally radiant base with the The Ordinary Serum Foundation SPF15, a medium coverage foundation with a semi-matte finish. With its lightweight feel and ultra-fluid, low-viscosity texture, it’s so easy to build the Serum Foundation to your ideal level of coverage. Its smooth texture makes blending a breeze, ensuring that your complexion looks perfected in moments. The rich and highly-saturated pigments within the formula are suspended in a proprietary spreadability system that glides effortlessly and doesn’t sit in fine lines, which allows your makeup to last longer. An added SPF of 15 provides protection against UV rays thanks to titanium dioxide, not nano-particles, whilst still feeling comfortable and lightweight on the skin. 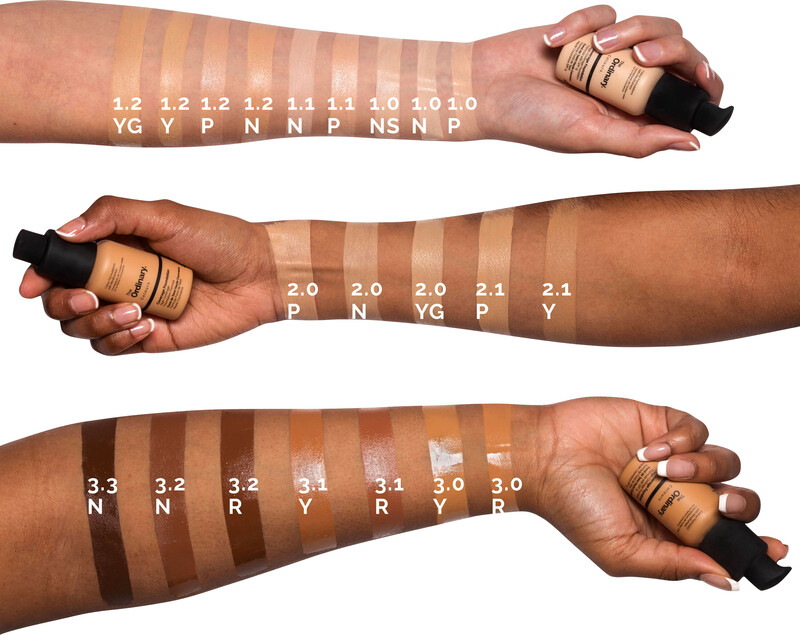 First choose the number that best describes your skin: 1 for fair to lighter tones, 2 for medium tones, and 3 for darker tones. Next, consider the depth of your shade and choose the second digit from 0 to 3. Finally, a letter is added to identify the undertone of the shade: P is pink, R is red , N is neutral, NS is neutral with silver highlighters, Y is yellow and YG is yellow with gold highlights. Shake well, then dispense a small amount onto the back of your hand. Apply from the centre of the face outwards, then blend with your fingers or a brush. It’s the perfect partner to the blurring High-Adherence Silicone Primer and smoothing High-Spreadability Fluid Primer. Vegan, paraben-free, sulphate-free, fragrance-free, alcohol-free, oil-free, nut-free, gluten-free, soy-free, cruelty-free. The Ordinary Serum Foundation SPF15 is rated 4.5 out of 5 by 10. Rated 5 out of 5 by Pbel from Great product I was recommended this by a friend and decided to give it a try. I will now be using these products all the time. Fantastic foundation that covers well, looks natural and feels fantastic. Rated 5 out of 5 by Mimi50 from Fabulous foundation This is the third bottle of The Ordinary Serum Foundation. I am 68 so skin is mature and this foundation gives me a medium coverage but looks absolutely natural which is the look I like. It goes on easily and the bottle lasts for ages. Will definitely keep buy as long as it's produced. Rated 5 out of 5 by Barb21 from Glad I found it Easy to apply. I have fair skin and chose 1.0P. . Not full coverage but buildablel. Good for daytime use. I am happy with this.